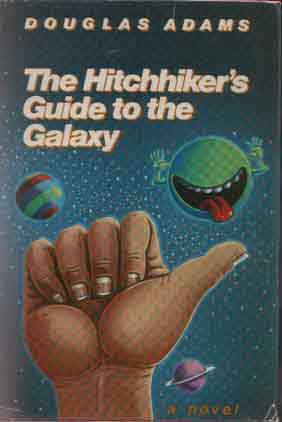 Book 1 : Hitchhikers guide to the galaxy : Review. Book 2: The Restaurant at the End of the Universe : Review. Book3 : Life, The Universe and Everything : Review. Arthur dent is back on the planet earth after hitchhiking in the universe for years, but he is in shock, because he saw in his own eyes that vogons destroyed palnet earth six months ago and also his house, but now earth and his house stood alive, he want to find how ? Plot : Arthur dent randomly hitchhiked his way through galaxy in a space craft and dropped on planet earth, surprisingly only few months has passed on earth while he is hitchhiking in the universe for years. He take a lift in the car to find his house, in the car he meet man named Russell and his sister Fenchurch. Russel explains him that many people has seen Yellow Ships few months back, but authorities are saying it as a “hallucinations with the big yellow spaceships”. When he come to his house, he finds a gift for him, a gray, fish bowl in which the “So Long and Thanks for All the Fish” words are inscribed. He also learns that all the dolphins from the earth have vanished just before the demolition of earth by Vogons. So long and thanks for all fish. Fenchurch (Fenny) and Arthur Dent head to Los Angeles, to find a man who know the reason behind the disappearance of the entire population of dolphins from the earth, from there they decide they want to see God’s final message to creation and goes in search of message. 1. Will the ever know the reason behind disappearance of the entire population of dolphins from the earth ? 2. Can they find God’s final message to creation. Funniest part is God’s final message to creation, which written in letters of flame thirty feet high (may be tourist attraction). Read it for Arthur, Read it for Fenchurch and there beautiful love story, read it for Marvin (This is the last time you will see him), and read it for God’s final message to creation. 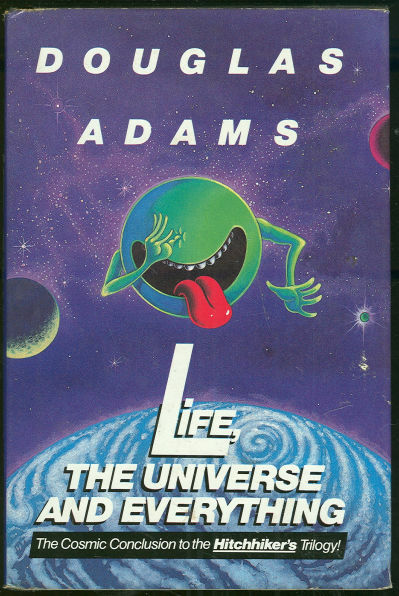 Life, The Universe And Everything by Douglas Adams is the thrid book in the Hitchhiker’s Guide To The Galaxy trilogy which consists of 6 books. Arthur Dent is in the pre-historic earth leaving in cave since last five years.One day suddenly Ford Perfect re-appears, with the sofa that just so happens to be going their way. So they both sit on the Sofa and re-appears in the modern time, at lords cricket stadium where match between England and Australia is going on, just two days before the Demolition of Earth By VOGONS. There they meet there old friend Slartibartfast, who came to lord for stoping the White Robots from stealing the Ashes, the Robots are from the Planet called Krikkit. These Robots are out for the mission, mission to collect the very important artifacts from around the universe to release there masters. Slartibartfast explains Arthur and Ford about the people of Krikkit : The people of the krikkit planet were happy without knowing the rest of the universe due to the dust cloud that surrounded its solar system. One day they surprised to see the spacecraft on their planet, by Reverse engineering the space craft, they explored past the dust cloud and saw the rest of the Universe, So they started to dislike it, so decided to destroy the whole universe, so they built the robots and started the legendary war know in galaxy as Krikkit Wars, but they defeated. So the rest of the universe decided to put the Krikkit planet in Slo-Time envelope, allowing Krikkit to survive long after the rest of the universe has ended. So the Wikkit Gate was the key to the envelop, So some of the Robots which escaped from Slo-Time envelop are now searching for Wikkit Gate key to release there masters and destroy whole universe. In a party, Arthur meets Zapod, Trillian and Marvin, and Slartibartfast tells them that, they are the only hope, they can only rescue universe from Krikkits. 1. Can they save the universe in time? 2. Can Arthur and Ford finds the Ultimate question for the Ultimate Answer for Life, The Universe And Everything? 3. Can the find, why people of Krikkit want to destroy the universe ? 4. Who is behind all this ? The writing style was just superb, Life, The Universe And Everything is slightly different from other two books, and highly entertaining and funny. Everything flows together, you just love the characters in the book. You can find The Hichhiker’s Guide To The Galaxy : Review here. 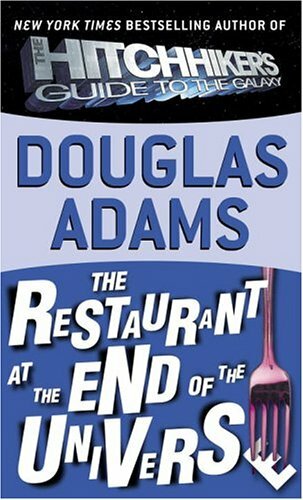 The Restaurant at the End of the Universe starts just as The Hitchhiker’s Guide to the Galaxy ended. Arthur Dent, Ford Prefect, Trillian, and Zaphod Beeblebrox have left the planet after finding the shocking secrets about Earth, Who is behind the construction of earth and some more secrets about universe, so after finding answers to the questions, and escaping from Vogons, they decided have a lunch at The Restaurant at the End of the Universe. When they decided to go to the The Restaurant at the End of the Universe, they found that they are not able to use the Improbability Drive, finally they came to know that, Computer is jammed by Arthur, when he request it for the cup of tea. When computer is jammed, Vogons start to fire at there space ship, Luckily, an ancestor of Zaphod’s, Zaphod Beeblebrox the Fourth saves them. Zapod and Marvin vanishes, and Arthur, Trillian and Ford are unaware of anything, waits in the ship and waits for computer to restart working, so that they can go the The Restaurant at the End of the Universe and have good lunch or dinner. Zapod and Marvin meets man named Zarniwoop, so after some time, they all reunited, and ships computer started working, so they escape from Zarniwoop by asking to be transported to the nearest restaurant. Which is at Milliways, the Restaurant at the End of the Universe, the nearest restaurant in the space but not in time. After the meal, Zaphod and Ford steal a spaceship, which belongs to rock band Disaster Area, programmed to dive into a star (sun), so they dramatically escape from there using that black ships teleporter. So Arthur and Ford end up on a ship destined to crash on a planet that looks very, very familiar…. there Arthur attempts to find the Ultimate question, for the Ultimate answer to life,universe and everything. Zapod and Trillian returns to the ship “Heart Of Gold”, which is now in control of Zarniwoop, and they all start there journey to find “who really rules the Universe”. The Restaurant at the End of the Universe is funny, it doesn’t matter how many times you read it, still it is funny. The book is perfect sequel to the The Hitchhiker’s Guide To The Galaxy. As in the previous book The Hitchhiker’s Guide To The Galaxy , the theories ,sci-fi, space-time are convincing. 1. Zapod : Who is now Ex-Galactic President. 2. Zaphod Beeblebrox the Fourth : The Gread Grand Father of zapod, who saves him from Vogons. 3. The Man Who Rules the Universe : This guy is really funny, really really funny :). 4. Marvin : The Depressed Robot. 5. Arthur Dent : Now in a planet, which looks very, very familiar…. 6. Ford Perfect : Alien friend from somewhere in the vicinity of Betelgeuse. 7. Trillian : Beautiful earth girl, who flies Hear of Gold. 8. Zarinwoop : The person, who want to find ” Who rules this universe “. This is the story of Arthur Dent and his alien friend Ford Perfect. Hitchhiker’s Guide to the Galaxy is the legend in the sci-fi category. The book is written by Douglas Adams. The book follows the adventures of Arthur Dent and his alien friend Ford Perfect in six parts. 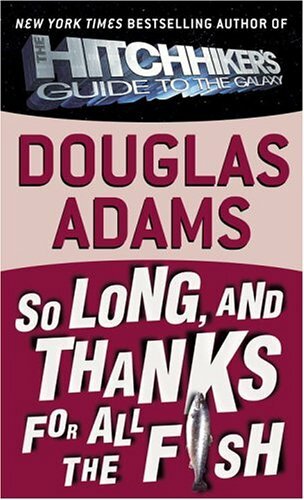 Originally Douglas Adams has written only 5 Novels, 6th “And Another Thing” Novel in this series is released recently which written by Eoin Colfer. The book begins on Thursday morning when Arthur Dent goes to bathroom for shaving, he sees a yellow bulldozer in front of his, when go out and inquires about bulldozer, they tell him that, they came to demolish his house for building the by pass. Arthur Dent’s friend Ford Perfect is an alien from a small planet somewhere in the vicinity of Betelgeuse and also a research of the book Hitchhiker’s Guide to the Galaxy. Ford rescues Arthur Dent before the seconds of earth’s demolition. The rescued by the spaceship of Vogons. So they are thrown out by VOGON ship, and they dramatically picked up by another ship named ” Heart Of Gold “, there they meet President of Galaxy : Zaphod Beeblebrox, who is Ford’s semi-cousin and the Galactic President. They visit the legendary planet Magrathea, where Aurthur meets person named Slartibartfast, who tells him about the history of Magrathea : Once the people of Magrathea fed up with question like ” Who they are “, ” why the universe exists “, “who created the universe” etc, So they decided to build the Super Computer which can answer these question, super computer of size of small city. They built a Super Computer, named it ” Deep Thought ” . Two Programmer asked the computer to give ” Ultimate Answer for Life,Universe and Everything”, computer tell them, it require 7 and Half million years. So after 7.5 M years computer reveals answer ” Ultimate Answer for Life,Universe and Everthing” is 42. Deep Thought tells that another computer, more powerful than itself would be made and designed by it to calculate the question for the ultimate answer. Then deep thought builds a computer, often mistaken for a planet because of its size and use of biological components as the operational parameters , was the Earth, and was destroyed by Vogons to make way for a hyperspatial express route, five minutes before the conclusion of its 10-million-year program for finding the question for ultimate answer 42. So Magrathean thought that Arthur mind can reveal the answer, because his mind has the last clue and he is the only person survived minutes before Earth demolition and he is the Operational Parameter of Super Super Computer Earth. Rest of the story follows how Arthur tries to find the answer for the question and also knows lots of things about universe with the help of Hitchhiker’s Guide to the Galaxy. I am sure , if you read one book, you are going to want to read all. Arthur Dent, who basically has no idea what is going on around him, just wondering why they destroyed the earth. Ford Prefect, Arthur’s friend from some where in the vicinity of Betelgeuse. Zaphod Beeblebrox Galactic persident who stole Heart Of Gold,He don’t know why he stole it, with his two heads, three arms. Trillian the lovely Earth girl who flies the Heart of Gold. Slartibartfast the planet builder who built Earth according to blue print of Deep Thought. The Vogons, who doesn’t care who you are. Overall, this is a book is highly entertaining and must read.